A report from market analytics firm Nielsen on Thursday found Android's U.S. growth to outpace Apple's iOS as smartphones accounted for two thirds of all new wireless phone purchases for the first time ever. According to the report U.S. smartphone penetration continued in the second quarter of 2012 as 54.9 percent of mobile users owned a smart device at the end of June. Contrary to last quarter's report, however, Android accounted for more new users than iOS which lead the segment as Google's OS appeared to be plateauing. Overall, Android kept its marketshare advantage with 51.8 percent while 34.3 percent of smartphone owners opted for the iPhone. 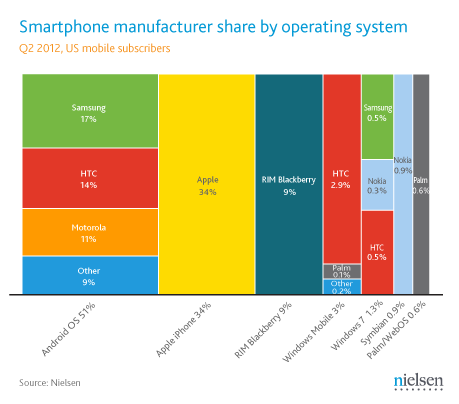 BlackBerry trailed with an 8.1 percent share of the market. Both Android and iOS showed signs of growth during June resulting in a respective 54.6 percent and 36.3 percent share of recent smartphone buyers. 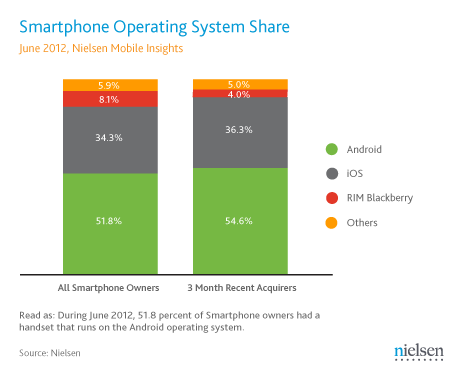 The two operating systems accounted for over 90 percent of the total smartphone market in the U.S. with RIM's BlackBerry lagging far behind with 4 percent as Windows Phone and other platforms combined to take 5 percent. The highest share of users once again went to Apple among nation's largest smartphone manufacturer with 34 percent of the market. Samsung garnered 17 percent of all Android sales followed by HTC and Motorola which came in with 14 percent and 11 percent, respectively.